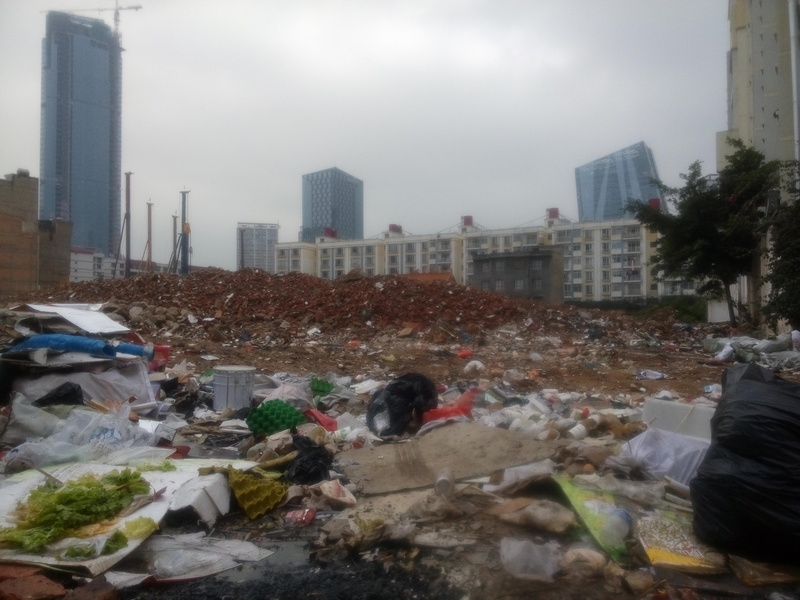 Since 2009, news outlets across China have repeated the mantra that “two-thirds of China’s cities face besiegement by garbage”—constituting a national crisis. Included is Kunming, the burgeoning capital of Yunnan Province. Yet, in addition to its propensity to “besiege”, proliferating waste matter has also generated economic opportunities for approximately 24 thousand rural migrants who make their living trading “waste-products” in the city. Mobile waste-product buyers in Kunming stake out their territory in public spaces outside of residential areas or rows of shops. Their buying points shift over time, in rhythm with the city’s rapid pace of demolishing older residential neighborhoods and building new high-rises and shopping malls in their wake—i.e., the rapidly shifting geography of the city. Transporting goods is a crucial part of the business, and different types of vehicles are used for the task. Most common and emblematic are sanlunche, (bicycle-drawn carts, or more literally “three-wheeled bicycles”). 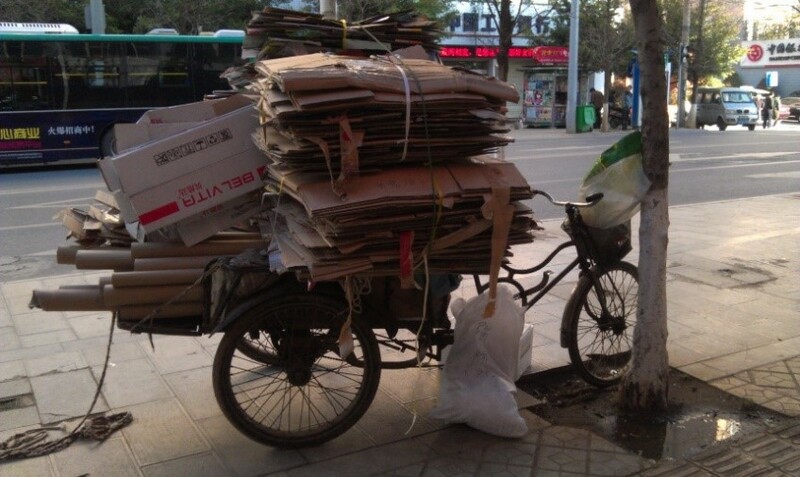 The buyers who rely on sanlunche use their labor power to break waste-products down; sort, package, and load them up; and pedal their loads to larger scale buying points—trying their best to avoid harassment by the urban management bureau and traffic police as they navigate Kunming’s increasingly congested city streets. 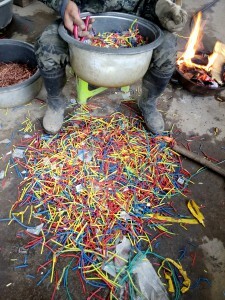 Although this work reduces the quantities of garbage left for the city to manage, while also consolidating and processing waste-products into raw materials for use in more legible forms of industrial production, the buyers are stigmatized for performing “informal” (bu guifan) or “illegal” business claimed to negatively affect “urban aesthetics” (shirong). It should be emphasized that in Chinese language the terms “garbage” (laji) and “waste-product” (feipin) have significantly different connotations. The former is understood not just as “matter out of place” (Douglas 1966), but also as that which is without (commodity) value and thus cannot be sold. In contrast, the latter is understood as the material remnants of urban life which, although also seen as being disruptive of urban order, have been recovered from or avoided materializing as “garbage” through having a secondary value potential activated. Thus, in the contemporary Chinese city most “waste-products”, as particularly unpolished commodities, are not generated ready-made as such. Activating the potential exchange values of post-consumer wastes necessitates the attention, care, and labor of various urban inhabitants. 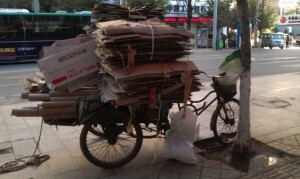 Kunming’s informal waste-product trade is largely contingent upon deeply engrained habits of thrift retained by a portion of the city’s inhabitants. These particular inhabitants tend to be older in age; they are often old enough to have lived through China’s socialist era, when the state attempted to elevate historically rooted practices of thrift, reuse, and recycling into moralized national imperatives (see Goldstein 2006). The “stewardship” with which these inhabitants handle everyday objects (Strasser 2000), including wastes, is vital to the functioning of the waste-product trade. If they did not meticulously save, break down, sort, and carry wastes to scrap traders, much of this excess matter would materialize simply as “garbage”. For, once individual pieces of waste are mixed together and discarded, they tend to pollute each other, lose their re-usability, and lose their potential to be transformed into “waste-products”. The prices of waste-products, which fluctuate in response to global economic trends, play the most crucial role in keeping this informal economy moving. When prices are high, profits can be made, especially for buyers who possess the resources to take advantage; but when prices drop, the industry tightens. The latter has been the trend in recent years. The army of poor rural migrants who work as part of China’s informal waste-product industry shrunk by millions after the global economic crisis in the late 2000s, as waste-product prices plummeted. In 2014, Kunming’s waste-product buyers often told me that they were not even earning enough money to cover their rising living expenses. Yet, many remained in the sector, unable to find alternative means of living. One buyer commented to me that when urban residents hear the extent to which prices have dropped they often say “I might as well just throw my waste-products in the river and forget about them.” Thus, plummeting prices not only affect the migrant buyers, they also reduce the percentage of waste which gets diverted from the garbage stream. In turn, the “besiegement” crisis grows. This growing crisis has led the city government in Kunming to embrace a new waste management strategy, one which is being both promoted and protested across China: incineration. Incineration plants utilize garbage as a raw material for the production of electricity, while also producing some particularly pernicious byproducts such as dioxins. 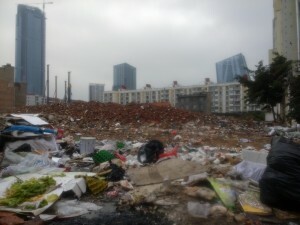 According to official publicity, five recently built incineration plants in Kunming process 100% of the city’s garbage. Yet, the management at one incineration plant which I visited emphasized that the amount of garbage they receive from city sanitation trucks is too small. They worry that at current rates they will need over twenty years to recoup their investment and start to profit from selling electricity, and they blame the government for approving the construction of too many incineration plants. In other words, they complain that there is not enough garbage. The local state’s embrace of incineration is thus in direct conflict with the informal waste-product trading industry: the incineration plants have a vested interest in waste materializing as “garbage” and not being transformed into “waste-products”. Incineration appears to perform a great trick by converting “garbage”, which in the growing field of “waste studies” is often taken to signify an antithesis of capital’s value form (Gidwani and Reddy 2011), into an object useful for industrial production and tied to prospects of future capital accumulation. Yet, the notion of converting waste to energy through utilizing “garbage-as-resource” conceals the fact that incineration generates bottom ash, fly ash, and other highly toxic pollutants. If the incineration coalition gets its way, mass consumption and “proper” waste disposal into the city’s waste infrastructure—which supplies hungry incineration plants—will continue to supplant thrift and a stewardship of objects, and the informal scrap trade will be pushed further into the margins of the city. Adam Liebman is a PhD candidate in sociocultural anthropology at UC Davis. His dissertation fieldwork is focused on the evolving political ecology of waste-product trading in Kunming, China. This research was supported by grants from the Wenner-Gren Foundation and the University of California Pacific Rim Research Program. This is the first short piece in a series of five which are focused on the generativity of waste and its various modalities of power in contemporary China and Taiwan. The series provides a follow-up to the panel “Living through Waste and Waste as Lively” presented November 21, 2015 at the 114th American Anthropological Association Annual Meeting in Denver, Colorado.